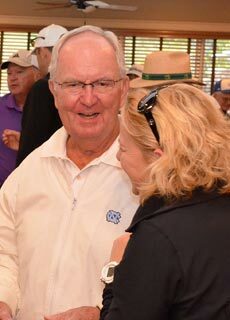 SPINDALE (Nov. 11, 2014) – The Voice of the Tarheels, Woody Durham, will be on hand at a reception at Isothermal Community College next week. The event will be held on Wednesday, Nov. 12, at 5 p.m. in The Foundation Performing Arts and Conference Center. The reception will be followed by a special announcement by President Walter Dalton and remarks from Durham, who will also be available for book signings and photo opportunities. More than 100 sponsors are contributing $100 each to support the event with the proceeds going to Isothermal’s college development fund. Sponsors will be recognized at the event. Anyone interested in attending and being a sponsor should see the contact information below. Durham was the play-by-play radio announcer for the North Carolina Tar Heels football and basketball teams from 1971 to 2011. He grew up in Albemarle alongside Bob Harris, longtime announcer for UNC rival, Duke University. The two played on the same little league team, were both on the same 1957 high school football team and sang together in the school chorus and a double quartet. Durham graduated from UNC-Chapel Hill in 1963 with a Bachelor’s degree in Radio, Television and Motion Pictures. He is a member of the Alpha Rho chapter of Phi Mu Alpha Sinfonia, the national fraternity for men in music. For years, many Tar Heel fans brought their radios to Kenan Stadium and the Dean Smith Center. Meanwhile, fans watching on television often turned down the sound so they could hear Durham's radio call. In 1981, Durham was named vice president and executive sports director at Tar Heel Sports Marketing. He was named North Carolina Sportscaster of the Year twelve times, most recently in 2006. On December 3, 2012, it was announced Durham would receive the first-ever Lombardi Excellence in College Broadcasting award. For information about sponsoring the event, contact Dee Dee Barnard at 828-395-1292 by noon on Monday, Nov. 10.